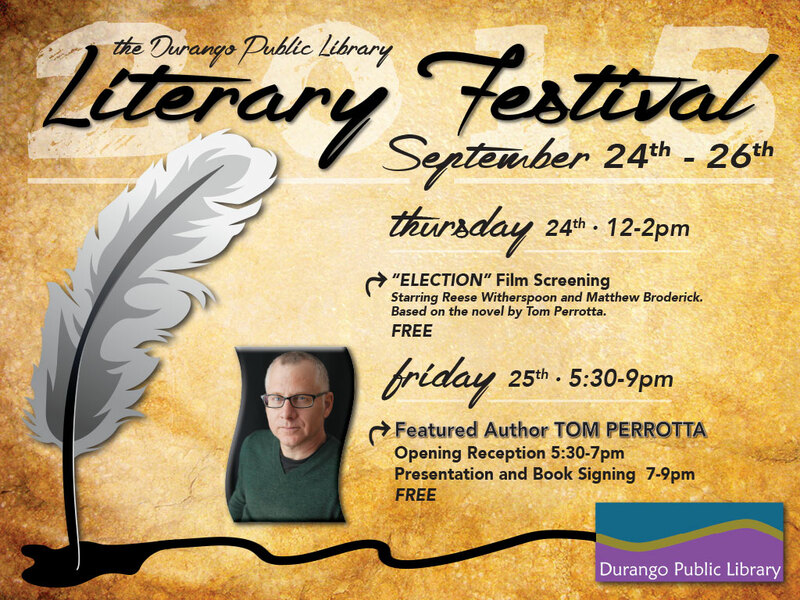 Friday, September 25 and Saturday, September 26 was the sixth annual Durango Public Library Literary Festival, and it was AWESOME!!! Literary fiction author and screenwriter Tom Perrotta was the keynote speaker on Friday night, and he was absolutely marvelous!! I read the New York Times review for his 2011 novel, The Leftovers, when it debuted, which is now an HBO TV show going into its second season this fall. I regret that I still haven’t read the book yet, but I purchased a copy Friday night, and Mr. Perrotta signed it for me. He added a personal message, too, which makes it even more cherished. During his presentation, Mr. Perrotta read brand new material from a novel in progress, which he said is two-thirds completed. The scene involved a young man narrating information about his family and his past, centered on his autistic young stepbrother, and the lengths his father and stepmother must take to care for and love their autistic son. The scene was beautifully written, deeply moving, touching in the very best way, and I hung on every word. Before the end of the selection, Mr. Perrotta choked up, which I found extremely endearing, as did my friends seated around me. During the Q&A session that followed, it was clear that everyone in the audience had been affected by the passage, and I know I’m not alone in wanting to buy this book as soon as it’s published, in late 2016 or early 2017. Because wow, the pages Mr. Perrotta read aloud were simply fantastic!! The next afternoon was the first-ever Local Authors Extravaganza, and I was one of the local authors chosen to participate. I regret that I didn’t advertise this event on my blog beforehand, though I did talk the event up on my personal Facebook page, as well as in emails with two book clubs I participate in, and the local group of authors/writers in town I oversee. The reason I failed to blog about the Local Authors Extravaganza is that, to put it bluntly, I was terrified. Full of a deep and endless dread. The kind that felt toxic if I thought about it for more than two seconds, so I did my best not to think about it at all. Like my protagonist Mary Jane in Love and Student Loans and Other Big Problems, I embrace and love my gift of denial whenever my terrors set in. And they were incredibly potent for this. The Extravaganza event was a luncheon in which eight local authors each visited a table of diners for seven minutes, gushed about our books and how wonderful they are, then a bell dinged and we would stand and go to the next table. We started the table rotation at 12:06 p.m., and 56 minutes later, the event came to an end. Why was I so terrified? Well, I’ve been told more than once that my books are not good, in emails, messages, as well as in conversation, and I know reading is subjective — not everyone is going to love the same kind of story — so “talking up” my work can be painful. No matter how much I tell myself that I have to cheerleader my work, cheerleading personal art is difficult, and I am like the majority of writers who find marketing myself to be a huge challenge. It’s just a self-esteem thing, I totally understand that. But knowing something intellectually is no guarantee that your emotions are going to “get smart” and stop being scared — and fear is fear. It’s debilitating, and it’s really hard to out-think it sometimes. On Wednesday last week, three days before the Extravaganza, I realized I couldn’t keep ignoring the fact that the event was almost here, so I decided to dress up as Wonder Woman that day. I bought a Wonder Woman costume last summer, for the sole purpose of helping me advertise my work, and the time had come to go with it. Time to put on my costume, stop being scared, and just be proud of my writing, my self-published novels, and promote my work as something worthwhile to read. My friend Julia Hastings-Black, who attended the event to advertise her brand new book, Cocktails at Dinner: Daring Pairings of Delicious Dishes and Enticing Mixed Drinks, took this photo of me right after the luncheon. The event was such a success!! I had a great deal of fun, and one woman named Sarah made it a particularly special day for me. I posed in a picture with her, and she bought my book, and told me she was sending my work to her family members to read — “This book is traveling everywhere!” she said, full of joy — and if it’s possible for human ears to hear angels singing in their celestial heaven, then that is exactly what I heard every time Sarah opened her mouth to speak — angels singing and singing and singing. I realized, on Saturday morning, right before I went to the luncheon, that this Wonder Woman costume doesn’t fit me anymore. It’s so massively baggy and kept threatening to fall off — but luckily, I suffered no Janet Jackson moments, and my superhero cape distracted from the bagginess — huzzah for capes!! I paired the outfit with black cowboy boots, which are Greg’s, and the boots flopped around on my feet like duck shoes — but I’m sure that added to the appeal. Wonder Woman in black cowboy boots, as my friend Michael Carson said, is “so American.” It was also well-suited to the wild west of Durango. Michael’s book speech was genius!! I told him I thought it would make a fantastic book trailer, if he wanted to create some art and video to go with it. If Michael creates a book trailer based on his Extravaganza speech, I will definitely be sharing it on my Thought Candy blog!! 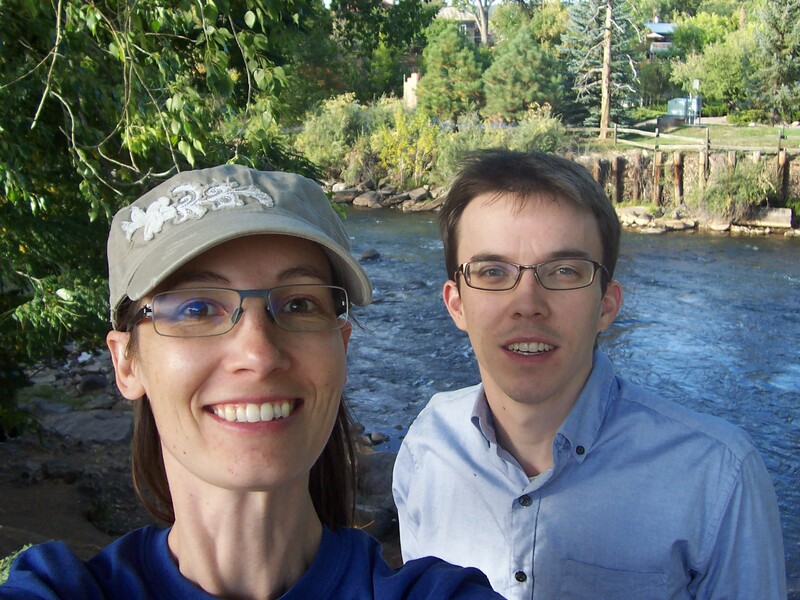 After that, Michael and I walked the river together, reading the first three chapters of another book advertised at the event, a YA (Young Adult) novel titled Burn Girl, about a 16-year-old girl named Arlie who ends up orphaned in Durango. Then Michael and I attended a poetry reading at St. Mark’s Episcopal Church here in town, and my friend Sharon Mehesy read three of her poems. They were beautiful poems, all about the power to change your perspective, and thus change your life — much like my drama in preparing for the Extravaganza! 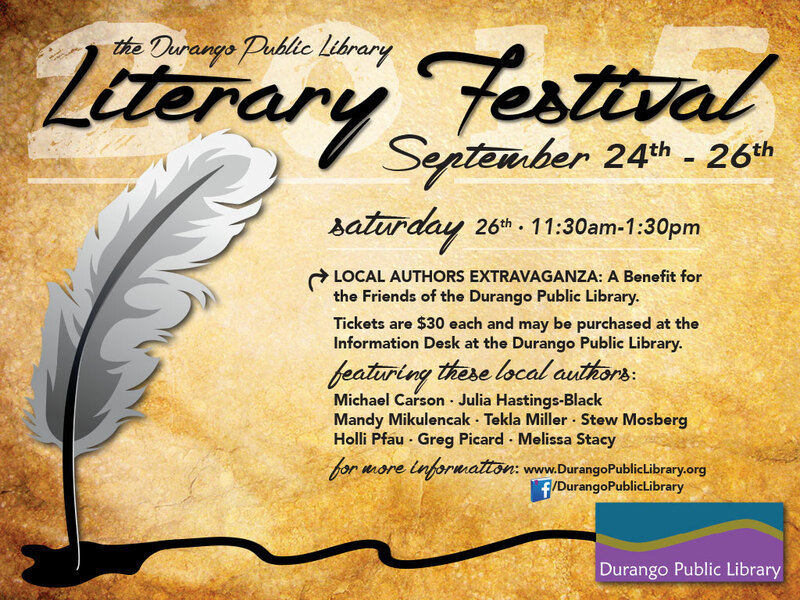 The Durango Public Library Literary Festival is one of my favorite events every year, each one special and memorable — and this year’s Local Authors Extravaganza was unique for SO many reasons — not least of which is the fact that the library did so much to host and promote this event. The Durango Public Library is such a beautiful place — from the people who work there to the design and location of the building itself — and local writers like me are extremely fortunate to have librarians who promote and support authors to such an extent. A lot of planning and effort went into making the Extravaganza such a success, and none of it would have been possible without the tireless work of such an amazing library staff. I can’t say enough how wonderful Sandy Irwin and Abby Lambert are, as well as everyone else who rolled up their sleeves to make this year’s Literary Festival such a fantastic event!! Literacy is the first superpower — sharing that message was the reason I bought my Wonder Woman costume in the first place — and libraries are where superheroes keep all their costumes, invisible jets, tools, and supplies. How small and miserable our lives would be without them! Huzzah for free books!! Can’t get enough of them! !